I don't know about you, but instead of a tax refund, I had to pay the government back this year. So, yeah, I could totally go for some free food and some great deals. If you did get money back from the government this year ... it's a win-win situation for you. Who doesn't love a great deal, right? 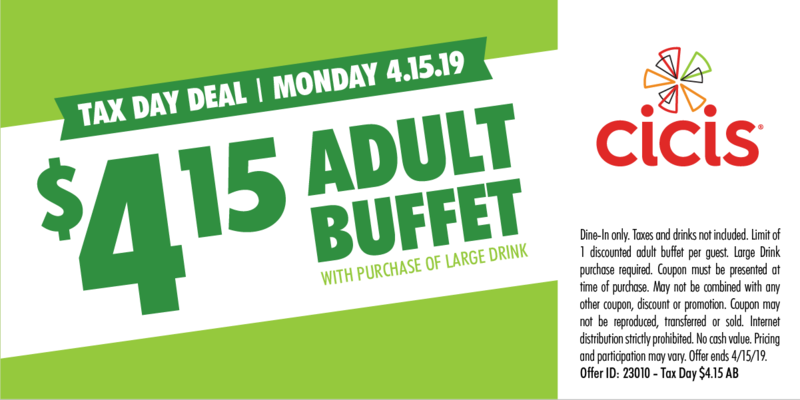 With this coupon, you can score the buffet rate of $4.15 when you buy a large drink at CiCis Pizza. Check White Castle's social media pages on Tax Day for a 15% off coupon any in-store order, according to Thrillist.com. Dairy Queen will be having a ton of offers on their app, according to Thrillist. Those deals include a buy-one-get-one for $.99 Treatzza Pizza, $2 cake shakes, BOGO kids meals, and more. Want more free stuff? You can see the full list on Thrillist.com for tips on how to score freebies at chains like Hardees, BurgerFi, Potbelly, and more.